I got this as a gift last Christmas and it's truly wonderful. The K-Drama Calendar depicts photos from your favorite Korean dramas. 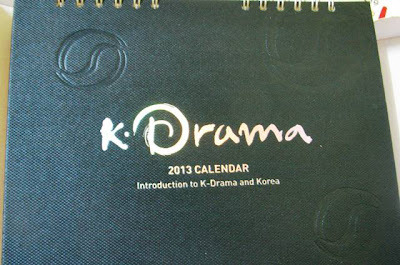 According to Korea.net, "The images featured in the K-Drama photo calendar 2013 were chosen on the recommendation of a consultative committee consisting of experts in culture and the arts. The photo calendar contains stills from a total of twelve Korean dramas: Winter Sonata (KBS), Sungkyunkwan Scandal (KBS), Daejanggeum (MBC), Heo Jun (MBC), Jumong (MBC), The Greatest Love (MBC), The 1st Shop of Coffee Prince (MBC), The Moon Embracing the Sun (MBC), Deep Rooted Tree (SBS), Secret Garden (SBS), You're Beautiful (SBS), and Shining Inheritance (SBS)." Now you can download your FREE K-Drama Calendar, which was produced by the Korean Culture and Information Service (KOCIS).